Square Enix has re-released Final Fantasy X on more platforms than I care to count. Now it's coming to Nintendo Switch. We've already written about those ports (here, and here, and here), so there's not much value in doing yet another review of yet another port - we'll do a short piece checking whether the standard is up to scratch on the Switch - but instead of writing a redundant review, I figured that something fun would be to look back at the game's cast of characters, and talk about their role within the game. As an added bonus, the little cards that we've got for each character below give you a couple of tips on how to use them in FFX's occasionally difficult combat. This was a game that was designed for players to use every character through the adventure, so each one has their own specific role on the battlefield. Tidus is, nominally, the protagonist of Final Fantasy X. In a sense he's a little irritating - here we have a story about a brave young woman (Yuna), going on a pilgrimage to sacrifice herself in order to placate a massive monster called "Sin," in the most overt and obvious allegory in Final Fantasy's history... and Tidus keeps trying to make it all about himself. The guy does have daddy issues, though, so it's not like he's an attention seeker without reason, and through his journey with Yuna and the gang it's clear that he goes through a significant coming of age experience. In fact, in many ways he's the character we go on the greatest growth journey with - from whiny brat with a ridiculous laugh scene, to eventually become a mature and sensible soul. Yuna's the character that has the most interesting narrative arc in Final Fantasy X. A naive but brave and determined girl, living in a tiny village on a tiny island, sets out on a grand pilgrimage that she - and everyone around her - knows will ultimately cost her life. What makes Yuna's arc so compelling is because it cuts to the core of the theological musings of Final Fantasy X - a game that is a deep conversation about religion. The tension between duty and the good that religion does for a society - giving people hope and putting their minds at ease - contrasted against the potential for organised religion to pervert that social value and turn it to its own ends. Japan is a nation that is deeply reverent, but deeply distrustful to the hierarchical view of religious organisations, and through Yuna's journey, and her changing understanding of her own faith, we see that play out in full. Kimahri's something of an enigmatic character. Functionally, he's actually really hard to use in Final Fantasy X, because he doesn't really have a role of his own; where Yuna's the healer and Lulu's the black mage, and where Auron's the tank and Rikku's the thief, Kimarhi is a jack of all trades, master of none, with few unique abilities of his own, making him most useful as a backup character. He is, however, the most tragic character in Final Fantasy X, for what happens to his entire people. I don't want to throw spoilers out there, just in case there are some people interested in Final Fantasy X who haven't yet played it, but I've always drawn a tight comparison between Kimahri and Chewbacca, the wookiee from Star Wars... and it's not just because they're both powerfully giant beings. What happens to their people is eerily similar. Before Hatsune Miku, there was Rikku. Ohhh Rikku. The perky, bright, cheerful girl with the green hotpants and a limited role in battle. she was useful for the first round or so to quickly steal whatever could be stolen, before replacing her with another party member more capable of doing the actual fighting. Her social role within the party dynamic was critical, however; she has a chipper voice and a bright outlook on life. 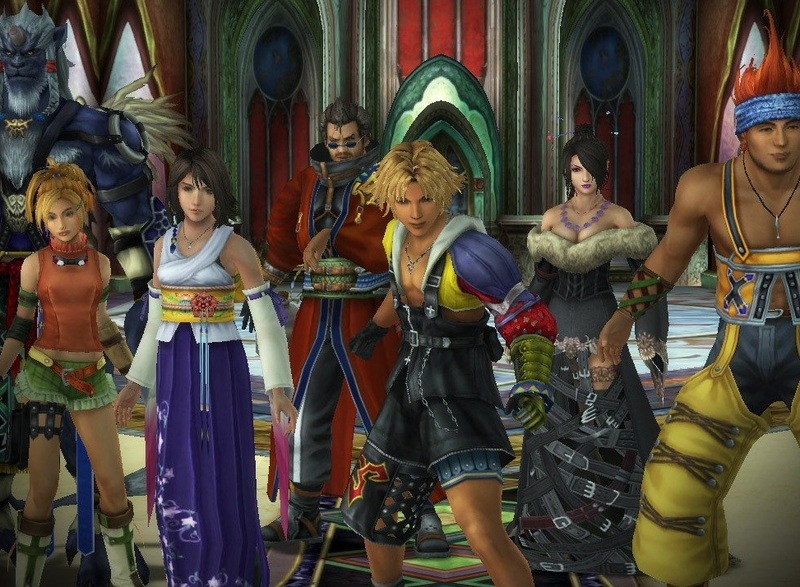 Final Fantasy X goes some pretty dark places, and does so with an astounding frequency. There aren't too many locations where the weight of the adventure doesn't press heavily. Within the script, it was largely down to Rikku and Wakka (below) to introduce some levity and provide those moments for the player to mentally relax. It's testament to the quality of the script that these two characters never went overboard to the point of becoming irritating, and were instead a welcomed part of the team indeed. Also Rikku introduced the world to the idea that Final Fantasy could sometimes get its fanservice on. Years later, I still appreciate that. To this day I'll never understand why Wakka has that Caribbean accent, but that's fine, we'll go with it. As with Rikku, above, in broad strokes Wakka's the comic relief of Final Fantasy X, but that's not to suggest that he doesn't have his moments where he proves that he's more than a dude with a boomerang ball for a weapon. Wakka's an interesting character, because a lot of his characterisation happens behind the scenes. Aside from the opening chapter, where he's the temporary guide for Tidus, he tends to sit in the background of most of Final Fantasy X's cut scenes. And yet, when Final Fantasy X-2 rolled around, we certainly found ourselves loving Wakka's cameo. Wakka represents a rather simple view on the world, with a clean and "common" sense of right and wrong. In a game that can be so densely theoretical, and the moral conflicts to divisive, I'd suggest that Wakka's role, backgrounded as it is, is to ground the story and provide us with that uncomplicated kind of wisdom. Auron is one of the most popular characters from Final Fantasy X - if you go digging through fan fiction for the game, Auron shows up as the protagonist almost as often as a combination of Yuna, Rikku, and Lulu show up doing very R18+ things to one another. Fan fiction is such a cursed place. But I digress. Part of the reason for Auron's enduring popularity, I suspect, is that he's absolutely essential in the combat team. I can't think of many circumstances in Final Fantasy X where you won't be relying on him to do the bulk of the heavy lifting. I say that because as a character he's rather flat. A bit like Gandalf from Lord of the Rings he's the old dude guide and shield, but the one so focused on the job that if the narrative were left exclusively to him it would be a very boring one indeed. It doesn't help that Auron's big "twist" is hugely anti-climatic, and doesn't really work because the game did nothing to establish an emotional connection between us and him through its run time. But hey, every party of heroes needs one killjoy to keep them honest, so Auron fulfills an important role there. Aside from having the strangest fetish for dresses made of belts, Lulu is an interesting character in the way that Square Enix has designed her. Historically, prior to Final Fantasy X, the black mages were designed as mysterious, dark characters - befitting their capacity for hurling murder magic around, but not really sufficient for the kind of characterisation needed in modern JRPG storytelling. Lulu initially has that too - the belts are nothing is not reminiscent of S & M, but that sense of mystery melts away pretty quickly as she reveals herself to be a somewhat severe, but motherly figure for the rest of the team. It's one of my favourite examples of character subversion that the entire Final Fantasy series has thrown up to date. Think about it - how many other times has a Final Fantasy game drawn up a character, and then written the story in such a way that the character design still makes sense, but they're the complete opposite what you expected. Vivi (another black mage) from Final Fantasy IX comes close, in that he's childlike despite wielding the most dangerous magical powers, but Lulu's maternal role is so much more nuanced and interesting. So, who's your favourite Final Fantasy X character? And, has that changed over the years? I know that while personally I'll always have a thing about Rikku, I find Lulu so much more appealing for her characterisation 15 years or however long it's been since I first played the game. On the other hand, my impression of Auron has changed from "oh he's so cool and tough" to something more like "dude needs a holiday to chill a little."